The contemporary study of sexuality too often finds itself at an impasse, conceptualizing sexuality either psychologically or sociologically: sexologists and psychologists have tended to point to the biological origins of sexuality underpinned by hormones, drives and, most recently, genetics; in contrast, historians and sociologists point to the social field as the defining force that shapes the meanings given to sexuality and sexual experience. Confronting the limitations and challenges this impasse poses, Katherine Johnson argues for a psychosocial approach that rethinks the relationship between psychic and social realms in the field of sexuality, without reducing it to either. Weaving through an expanse of theoretical and empirical examples drawn from sociology, psychology, queer and cultural studies, she produces an innovative, transdisciplinary perspective on sexual identities, subjectivities and politics that makes an original contribution to key debates ranging from identity politics and gay marriage, to mental health ‘risks’ and queer youth suicide. Embracing ideas from developmental psychology, social constructionist sociology, social and critical psychology, psychoanalysis and queer theory, this original book will be necessary reading for students and scholars of sexuality across the social sciences. "Any student of sexuality will appreciate the vast wealth of sources which Johnson has compiled in this book, and her arguments make an excellent contribution to that much-theorised conceptual impasse. Johnson’s lucid style and clarity of thought do also make this book suitable for those with only an intermediate level of knowledge (it would serve, for example, as a much better introduction to the field than Butler’s abstruse language)." "Katherine Johnson aims to “queer” false polarities within the study of sexuality. She attempts to evaluate how sexuality can be studied more holistically. Always on the side of social justice, Johnson's book is also a political engagement with sexuality. This highly ethical book should be required reading for those working inbetween and across disciplines, and those entrenched within institutional paradigms who cannot see the wood for the trees." 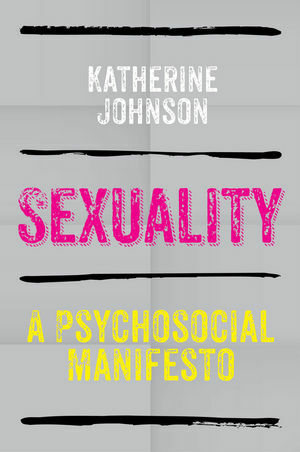 "Appreciative of social constructionist approaches while recognizing their limits, Katherine Johnson clears the way for a much-needed psychosocial analysis of sexuality. Along the way, she takes us on a tour of many of the field’s crucial debates gay genes, the origins of desire, the affective turn, among others steadfastly refusing the reductionism that all too frequently plagues dominant paradigms." Any student of sexuality will appreciate the vast wealth of sources which Johnson has compiled in this book, and her arguments make an excellent contribution to that much-theorised conceptual impasse. Johnson’s lucid style and clarity of thought do also make this book suitable for those with only an intermediate level of knowledge (it would serve, for example, as a much better introduction to the field than Butler’s abstruse language).